Micrograph of haemosiderosis. Liver biopsy. Iron stain. Iron overload, also known as hemochromatosis or haemochromatosis, indicates accumulation of iron in the body from any cause. The most important causes are hereditary haemochromatosis (HHC), a genetic disorder, and transfusional iron overload, which can result from repeated blood transfusions. Organs commonly affected by haemochromatosis are the liver, heart, and endocrine glands. Cirrhosis of the liver: Varies from zonal iron deposition to fibrosis (cirrhosis). Diabetes due to selective iron deposition in pancreatic islet beta cells leading to functional failure and cell death. Arthritis, from calcium pyrophosphate deposition in joints. The most commonly affected joints are those of the hands, particularly the knuckles of the second and third fingers. The causes can be distinguished between primary cases (hereditary or genetically determined) and less frequent secondary cases (acquired during life). People of Celtic (Irish, Scottish, Welsh, Cornish, Breton etc. ), English, and Scandinavian origin have a particularly high incidence of whom about 10% are carriers of the C282Y mutation on the HFE gene associated with HLA-A3 and 1% suffer from the condition. Although it was known most of the 20th century that most cases of haemochromatosis were inherited, they were incorrectly assumed to depend on a single gene. The overwhelming majority depend on mutations of the HFE gene discovered in 1996, but since then others have been discovered and sometimes are grouped together as "non-classical hereditary haemochromatosis", "non-HFE related hereditary haemochromatosis", or "non-HFE haemochromatosis". Most types of hereditary haemochromatosis have autosomal recessive inheritance, while type 4 has autosomal dominant inheritance. Selective iron deposition (blue) in pancreatic islet beta cells(red). Serum ferritin: In males and postmenopausal females, a serum ferritin value of over 300 ng/mL (670 pmol/L) indicates iron overload. In premenopausal females, a serum ferritin value of over 150 or 200 ng/mL (330 or 440 pmol/L) indicates iron overload. Serum ferritin testing is a low-cost, readily available, and minimally invasive method for assessing body iron stores. However, the major problem with using it as an indicator of iron overload is that it can be elevated in a range of other medical conditions unrelated to iron levels including infection, inflammation, fever, liver disease, renal disease, and cancer. Also, total iron binding capacity may be low, but can also be normal. The standard of practice in diagnosis of haemochromatosis was recently reviewed by Pietrangelo. Positive HFE analysis confirms the clinical diagnosis of haemochromatosis in asymptomatic individuals with blood tests showing increased iron stores, or for predictive testing of individuals with a family history of haemochromatosis. The alleles evaluated by HFE gene analysis are evident in ~80% of patients with haemochromatosis; a negative report for HFE gene does not rule out haemochromatosis. In a patient with negative HFE gene testing, elevated iron status for no other obvious reason, and family history of liver disease, additional evaluation of liver iron concentration is indicated. 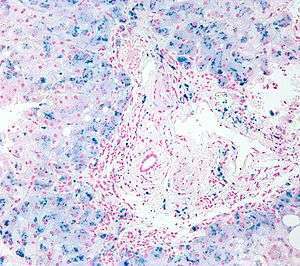 In this case, diagnosis of haemochromatosis is based on biochemical analysis and histologic examination of a liver biopsy. Assessment of the hepatic iron index (HII) is considered the "gold standard" for diagnosis of haemochromatosis. Family members of those with primary haemochromatosis should be screened to determine if they are a carrier or if they could develop the disease. This can allow preventive measures to be taken. Screening the general population is not recommended. Routine treatment in an otherwise-healthy person consists of regularly scheduled phlebotomies (bloodletting or erythrocytapheresis). When first diagnosed, the phlebotomies may be fairly frequent, until iron levels can be brought to within normal range. Once iron and other markers are within the normal range, treatments may be scheduled every other month or every three months depending upon the underlying cause of the iron overload and the person's iron load. A phlebotomy session typically draws between 450 to 500 cc whole blood. For those unable to tolerate routine blood draws, there is a chelating agent available for use. The drug deferoxamine binds with iron in the bloodstream and enhances its elimination in urine and faeces. Typical treatment for chronic iron overload requires subcutaneous injection over a period of 8–12 hours daily. Two newer iron chelating drugs that are licensed for use in patients receiving regular blood transfusions to treat thalassaemia (and, thus, who develop iron overload as a result) are deferasirox and deferiprone. Affected individuals over age 40 or who have high serum ferritin levels are at risk for developing cirrhosis. Iron overload increases the risk of hepatocellular carcinoma. This risk is greater in those with cirrhosis but is still present in those without cirrhosis. Significant problems occur in around one in ten. It is most common in certain European populations (such as the Irish and Norwegians) and occurs in 0.6% of the population. Men with the disease are 24 times more likely to experience symptoms than affected women. Historically, the term haemochromatosis (spelled hemochromatosis in American English) was initially used to refer to what is now more specifically called haemochromatosis type 1 (or HFE-related hereditary haemochromatosis). Currently, haemochromatosis (without further specification) is mostly defined as iron overload with a hereditary/primary cause, or originating from a metabolic disorder. However, the term is currently also used more broadly to refer to any form of iron overload, thus requiring specification of the cause, for example, hereditary haemochromatosis. Hereditary haemochromatosis is an autosomal recessive disorder with estimated prevalence in the population of 1 in 200 among patients with European ancestry, with lower incidence in other ethnic groups. The gene responsible for hereditary haemochromatosis (known as HFE gene) is located on chromosome 6; the majority of hereditary haemochromatosis patients have mutations in this HFE gene. Hereditary haemochromatosis is characterized by an accelerated rate of intestinal iron absorption and progressive iron deposition in various tissues. This typically begins to be expressed in the third to fifth decades of life, but may occur in children. The most common presentation is hepatic (liver) cirrhosis in combination with hypopituitarism, cardiomyopathy, diabetes, arthritis, or hyperpigmentation. Because of the severe sequelae of this disorder if left untreated, and recognizing that treatment is relatively simple, early diagnosis before symptoms or signs appear is important. In general, the term haemosiderosis is used to indicate the pathological effect of iron accumulation in any given organ, which mainly occurs in the form of the iron-storage complex haemosiderin. Sometimes, the simpler term siderosis is used instead. Haemosiderosis is haemochromatosis caused by excessive blood transfusions, that is, haemosiderosis is a form of secondary haemochromatosis. Haemosiderosis is haemosiderin deposition within cells, while haemochromatosis is haemosiderin within cells and interstitium. Haemosiderosis is iron overload that does not cause tissue damage, while haemochromatosis does. Haemosiderosis is arbitrarily differentiated from haemochromatosis by the reversible nature of the iron accumulation in the reticuloendothelial system. 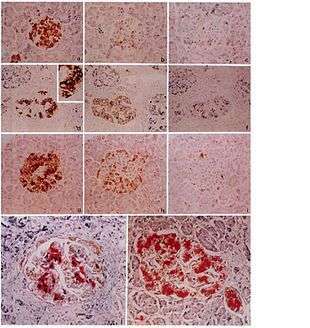 1 2 3 Lu JP, Hayashi K. Selective iron deposition in pancreatic islet B cells of transfusional iron-overloaded autopsy cases. Pathol Int. 1994 Mar;44(3):194-9. PubMed PMID 8025661. ↑ John Murtagh (2007). General Practice. McGraw Hill Australia. ISBN 0-07-470436-2. ↑ Lu JP, Hayashi K. Transferrin receptor distribution and iron deposition in the hepatic lobule of iron-overloaded rats. Pathol Int. 1995 Mar;45(3):202-6. PubMed PMID 7787990. ↑ Bruce R Bacon, Stanley L Schrier. "Patient information: Hemochromatosis (hereditary iron overload) (Beyond the Basics)". UpToDate. Retrieved 2016-07-14. Literature review current through: Jun 2016. | This topic last updated: Apr 14, 2015. ↑ Pietrangelo, A (2003). "Haemochromatosis". Gut. 52 (90002): ii23–30. doi:10.1136/gut.52.suppl_2.ii23. PMC 1867747 . PMID 12651879. ↑ Cam Patterson; Marschall S. Runge (2006). Principles of molecular medicine. Totowa, NJ: Humana Press. p. 567. ISBN 1-58829-202-9. ↑ labtestsonline.org > TIBC & UIBC, Transferrin Last reviewed on October 28, 2009. 1 2 Pietrangelo, Antonello (2010). "Hereditary Hemochromatosis: Pathogenesis, Diagnosis, and Treatment". Gastroenterology. 139 (2): 393–408. doi:10.1053/j.gastro.2010.06.013. PMID 20542038. ↑ Ghugre NR, Enriquez CM, Gonzalez I, et al. MRI detects myocardial iron in the human heart. Magn Reson Med. Sep 2006;56(3):681-6. 1 2 3 4 Crownover, BK; Covey, CJ (Feb 1, 2013). 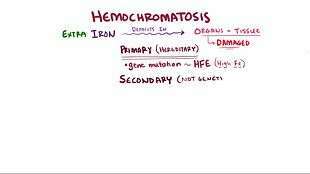 "Hereditary hemochromatosis.". American family physician. 87 (3): 183–90. PMID 23418762. ↑ Barton, James C. (1 December 1998). "Management of Hemochromatosis". Annals of Internal Medicine. 129 (11_Part_2): 932. doi:10.7326/0003-4819-129-11_Part_2-199812011-00003. ↑ Choudhry VP, Naithani R (2007). "Current status of iron overload and chelation with deferasirox". Indian J Pediatr. 74 (8): 759–64. doi:10.1007/s12098-007-0134-7. PMID 17785900. ↑ Hoffbrand, A. V. (20 March 2003). "Role of deferiprone in chelation therapy for transfusional iron overload". Blood. 102 (1): 17–24. doi:10.1182/blood-2002-06-1867. 1 2 Kowdley, KV (November 2004). "Iron, hemochromatosis, and hepatocellular carcinoma.". Gastroenterology. 127 (5 Suppl 1): S79–86. PMID 15508107. Jonas: Mosby's Dictionary of Complementary and Alternative Medicine. 2005. Rodot, S; Lacour, JP; Dageville, C; Castanet, J; Boutté, P; Ortonne, JP (1994). "["Bronze baby" syndrome].". Annales de dermatologie et de vénéréologie. 121 (8): 568–70. PMID 7755316. Wikimedia Commons has media related to Hemochromatosis.